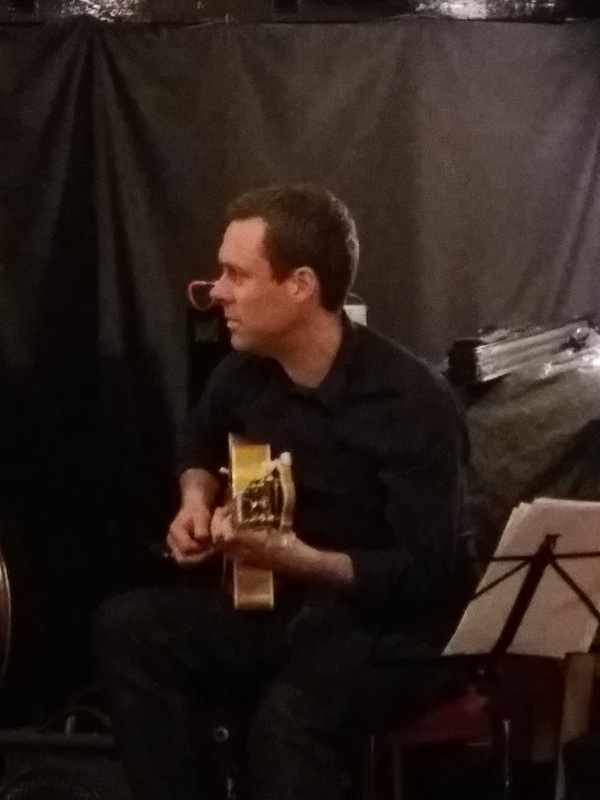 This evening’s concert at the Black Bull on Bridge Street exemplified what Blaydon Jazz Club is all about…a select list of tunes drawn from the Great American Songbook performed impeccably to a discerning audience. Giles Strong and fellow guitarist Roly Veitch put their heads together to come up with a set list and invited bassist Ian Paterson and drummer Russ Morgan to join them to play a few numbers for the love of it, and, if anyone should drop by to listen, so much the better. And drop by they did. Familiar faces took their regular seats and, without fanfare, Giles Strong and friends began with Out of Nowhere (comp Johnny Green), each musician introducing themselves in solo spots. A simple format, if it ain’t broke…Alone Together (comp Arthur Schwartz, lyrics Howard Dietz) continued the formula with first Giles then Roly introducing a tune and taking the time to talk about the composer (and lyricist) in much the same way as Frank Sinatra did so fastidiously during a long career dedicated to singing the very best songs of the popular composers of the day. There Will Never Be Another You (Harry Warren/Mack Gordon) featured a short solo from drummer Russ Morgan and, standing to his left, bassist Ian Patterson played it ‘just so’ all night; unobtrusive, fully engaged, enjoying the occasion. Benny Golson’s Whisper Not, heard for a second time in just three days by your reviewer, worked well without the horns. Did anyone hear the Jazztet in concert in Britain? Indeed, did the Benny Golson-Art Farmer sextet ever make it to these shores? Russ Morgan is a master of the art of hand drumming and on Flamingo (Grouya/Anderson) gave a mini-masterclass, making it look easy into the bargain. A fine first set concluded with Irving Berlin’s How Deep is the Ocean? Blaydon Jazz Club’s CD stall did a little business, the raffle was well supported (your reviewer went home empty handed!) and there was time for a chat with some of the regulars (and not so regulars; four keen imbibers, one clutching a copy of the beer list from the recent Newcastle Beer and Cider Festival!). An unexpected development…Roly’s amp began to play up, or so he thought. Everyone carries a spare wheel in the boot, Blaydon Jazz Club’s long-serving promoter carries a spare amp! Our two guitarists (Giles and Roly) exchanged ideas on You’d Be So Nice To Come Home To as Russ skittered brushes across his kit…he really is a master percussionist. A nice start to the second set. From Cole Porter to Brooks Bowman’s East of the Sun (and West of the Moon). More Cole Porter to follow, but wait, it was at about this juncture that Roly realised his ‘malfunctioning’ amp was not to blame, it was his guitar that was playing up! Few guitarists have a spare six-string in the boot of the car and Roly was no different. The show must go on and it did! Jimmy Van Heusen’s Darn That Dream (lyrics Eddie DeLange) staked a claim as tune of the night, Eden Ahbez’s strange (or should that be the strange Eden Ahbez?) Nature Boy featured Giles and Roly and again on Wes Montgomery’s West Coast Blues. 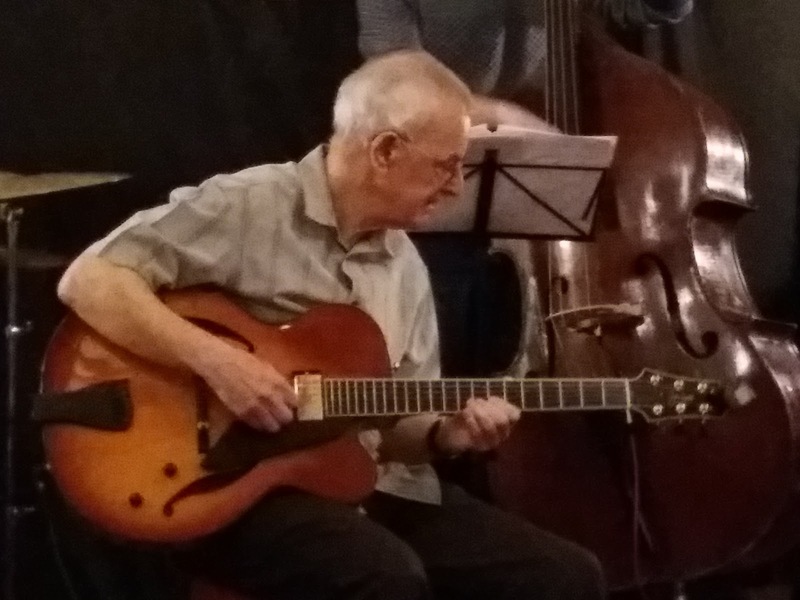 A typically enjoyable evening at Blaydon Jazz Club concluded with the Giles Strong Quartet playing I’ll Remember April (composer Gene de Paul, lyricists Patricia Johnston and Don Raye). The irony wasn’t lost on some in the fact that Roly didn’t sing at all on the night yet, typical of the calibre of musicians on the stand, they ensured that the composers and lyricists were duly credited. It’s what Blaydon Jazz Club does. 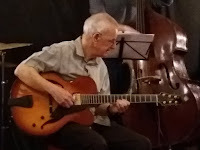 This was a wonderful jazz gig at Roly's club ...... for me, it's always an exquisite experience to be sitting so close to these guitar maestros at work - every note so clear. The repertoire was superb, each number a classic of those magical Great American Songbook years - though I think Whisper Not was written in the mid 1950's. Incidentally, it was interesting to compare this take on the tune, with the one I heard a couple of days before - Lewis Watson, and the Mick Shoulder Quintet - fabulously played in a full, excitingly driven Jazz Messengers bop way. Tonight, the two guitars, plus drums and bass, took the tune right back to the melody - sublime!